The name of this bird comes from its call “hoop-hoop-hoop”. 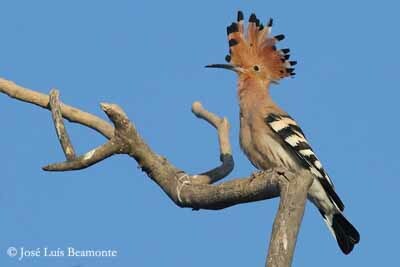 Very nice bird with conspicuous crest often fanned, the Hoopoe is often heard in the country. It perches in open, giving repeatedly its typical call. Adult male has pinkish to sandy-buff plumage on head, neck, mantle and underparts (more pinkish). Rump and belly are white. The rounded wings are black, barred white across the primary tips. Inner primaries show white tips. When the wings are closed, we can see several broad white bars. The slightly rounded tail is black with only one white bar. 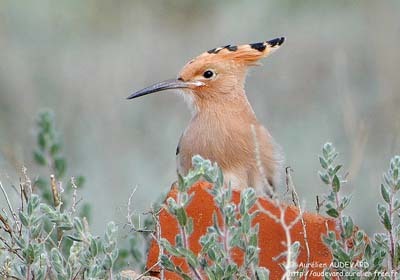 On the head, the conspicuous crest is sandy-buff with black and white tips. This crest is usually depressed, but during the displays, the bird opens it as a wonderful fan. This crest is composed of 28 feathers. The long, down-curved bill of about 5-6 cm long is blackish, paler at base. Eyes are dark brown. Legs and feet are grey. Female is almost similar in plumage, but she is slightly smaller than male. Her plumage is often duller with paler throat. Juvenile resembles female with shorter crest and bill. It has white commissures, making easy for parents to see them in the darkness of the nest. We can find 9 subspecies sharing the wide range, with some variations of plumage. 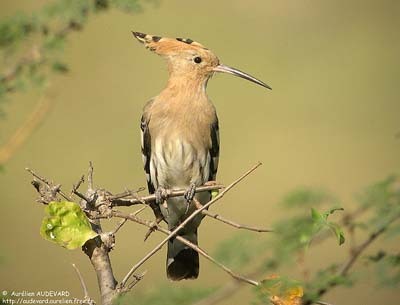 The race “senegalensis” with other sub-Saharan races, are treated as a race of the African Hoopoe – Upupa Africana which is the darkest, with deep rufous plumage and black tips on crest, without any white patch. 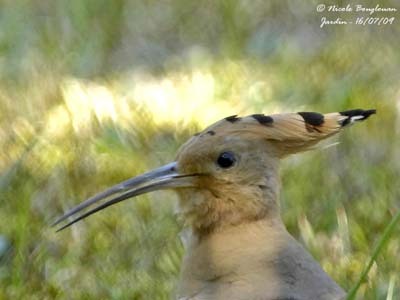 The Hoopoe’s typical call is a resonant phrase “hoop-hoop-hoop”, often heard in the morning during the spring. This phrase may include 2-5 notes with short pauses between them. This song is far-carrying. When excited, the bird also utters harsh rasping call “schaahr”. The bird usually sings from high perch, tree or roof. 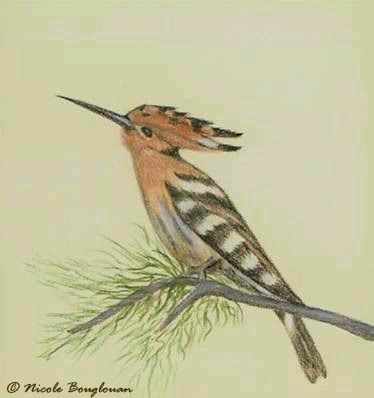 This song may extend over many minutes, while the male bows the head downwards for increasing the volume of air, the neck is inflated and then, the throat pulses it outwards with each note. 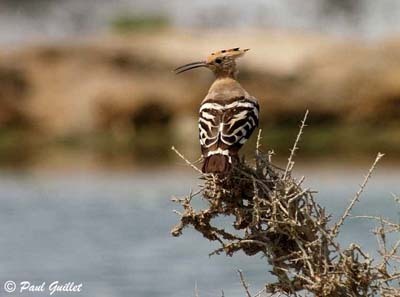 The Hoopoe frequents several types of habitats in open country such as cultivated areas, vineyards, orchards, olive groves, steppes or wooded savannahs, according to the range. It needs some trees and cliffs for roosting and nesting in holes, perches for singing and food sources. This species is often seen around or in villages and farmlands, and frequents forest edges or open woodlands in some parts of the range. It prefers the areas with bare grounds or short-grass for foraging. 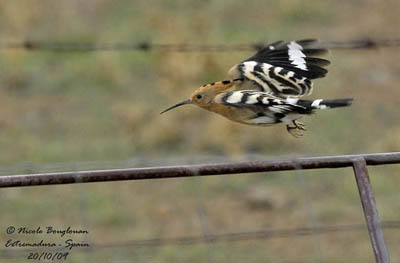 Hoopoe has wide range and is common in Europe, North and Sub-Saharan Africa, Madagascar and Asia. The most part of the northern populations migrates to tropical regions in winter. The African birds are resident in their range. 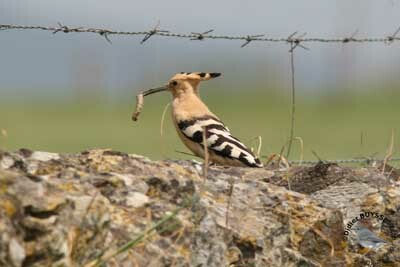 Hoopoe feeds mainly on animal food and some plant matter as supplement. This species is insectivorous, using the long decurved bill to find and extract the larvae and pupae of insects from the ground. 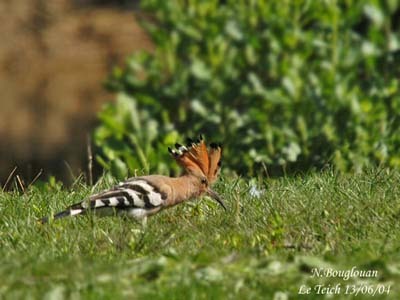 Hoopoe forages by walking about, often giving short jabs of the bill. Sometimes, the bird stops and inserts the bill into the soil in order to seize the items sensed with the tip. It also may dig strongly when pursuing a prey into its burrow. Hoopoe also probes the leaf litter and the dry animal droppings, and peaks about in rubbish-dump. This bird is able to take large and hard insects such as Cockchafers, crickets and Lucanidae. The largest preys are beaten on the ground to remove the hard parts such as legs, elytra and wings. It also catches and beats lizards before to toss the prey into the right position to be swallowed. 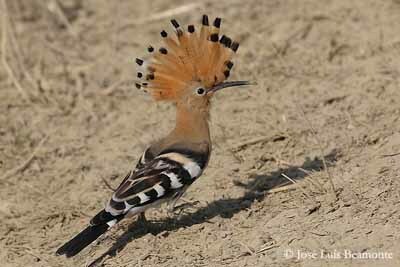 Hoopoe forages alone while the crest feathers are depressed, but sometimes, the bird raises them in a spectacular fan. When the breeding season starts, the male utters its insistent song in the early morning, proclaiming the territory of the nest-site. Fights and song-duels occur sometimes, and songs can continue over the whole nesting period. Singing is the main advertisement display of males, but some aerial and terrestrial behaviour such as chasing between males (and females) have been observed. These aerial chases show the excited bird flying back and forth. Aerial fights involve leaping and fluttering in the air. During these behaviours, the crest is often raised. During the courtship displays, male chases female and later, courtship feeding begins. Then, the male searches for the nest-site that involves the establishment of the territory. Copulation usually follows courtship feeding and occurs on the ground or on large branch, but often near the nest-site. 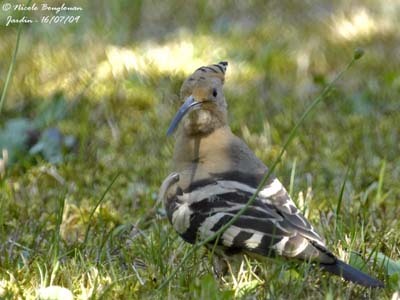 Hoopoes are monogamous, but pair-bonds usually last only for one season. The northern populations are migratory, whereas others are partially migrants. This species migrates to tropical regions in winter. Hoopoe has rounded wings with conspicuous black and white barring. This bird performs powerful flight with slow wing-beats. The flight is undulating, performed over short distances, from perch to perch. Hoopoe flies alone or in pairs, with some distance between the mates. During the migrations, they may fly in groups, but always with some distance between each other. 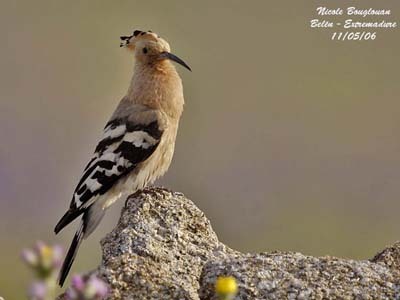 Hoopoe nests in natural cavities such as holes in trees, walls, buildings and monuments, on cliffs and among boulders, and even in nest-boxes when available. Female cleans the cavity by removing all items found inside. The interior can be lined or not. But sometimes, there are some feathers or dry grasses. Female lays 5-9 pale grey or white eggs, laid at daily intervals. Incubation lasts 16 to 18 days, by female. At hatching, chicks are covered with down. The crest appears two weeks later. At 20-24 days of age, the chicks are visible at the entrance of the hole. The nesting period varies from 26-32 days in South Africa, to 24-28 days in Europe and Asia. Young are fed by both parents with insects, but they come to the ground to probe for food very soon. Parents regularly remove the chick’s dejections or not, but in response to potential nest-predators, this species produces an evil smelling fluid by the uropygial gland, in order to make the nest repugnant for intruders. In addition, at about six days of age, chicks are able to squirt faeces and cloacal contents at the intruder. The chicks perform some defence displays with raised crest and cocked fanned tail, while they utter snake-like hisses and give sharp jabs with the bill. 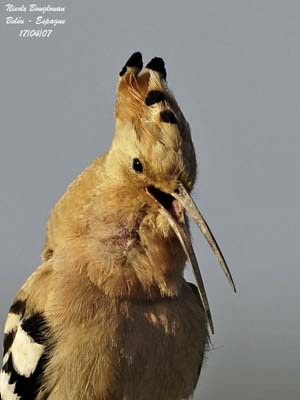 Hoopoe feeds primarily on large insects and their larvae and pupae, such as large crickets, beetles, caterpillars, termites, ants, locusts, centipedes and also spiders. Largest preys are beaten against the ground to remove the indigestible parts. It also takes small lizards, snakes and amphibians, and some plant matter such as leaves, seeds, berries and roots. 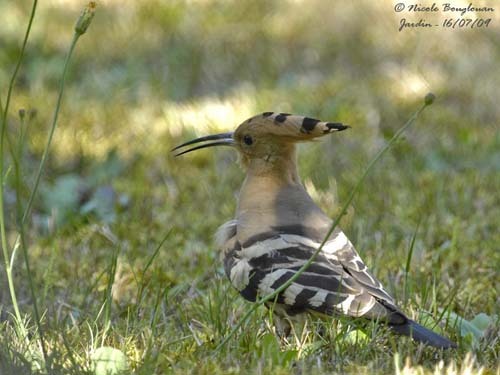 Hoopoe is relatively common in its range, and the species is protected in numerous countries. According to the range, it may be vulnerable or endangered, due to disturbances, hunting, cutting of old trees and use of pesticides. 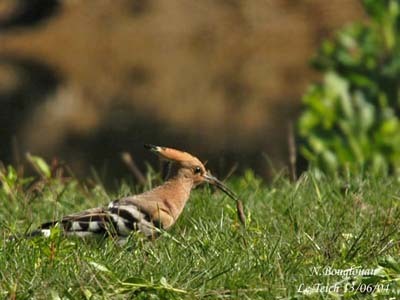 Hoopoe is part of numerous legends in several countries. This bird announces the spring. It would be able to find subterranean water source in deserts only by probing the sand with the bill. 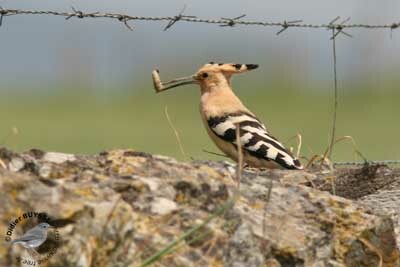 The latest legend tells that to hear the Hoopoe’s song involves great wine harvest. So, please, listen to it! 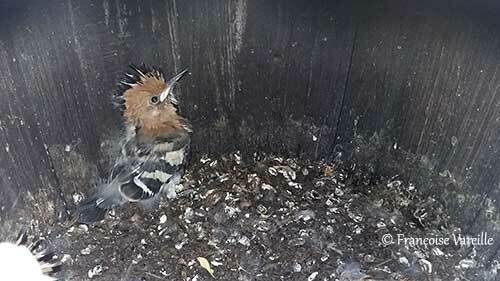 Thank you to Françoise Vareille for this beautiful observation of a pair of Hoopoes nesting in a cask in her backyard. They nest in her garden since three years. Only 4 chicks still alive on July 11th. An egg has not hatched and 2 chicks died. The adults did not removed them from the nest.